"My Realtor friend told me that it's free to use their services. Is that true?" In this article, we'll debunk this homebuying myth and explore who actually pays the buyer's agent commission. As a buyer, your agent and the seller’s agent split a commission fee -- typically 5-6% of the purchase price of the home. And while this fee is technically paid by the seller, it’s factored in to how much sellers list their home for. Since these fees get baked into a home’s listing price, and you’re the only one who has to pay money at closing, the buyer's agent commission gets passed onto you when you buy a home. In other words, it comes from your mortgage/loan on the home. Standard practice is that the seller pays the real estate commission of both the listing agent and the buyer's agent, according to Ruth Johnson, a Realtor® in Austin, TX. But she also points out that "while sellers pay the fees, they usually wrap them into the price of the home. In that sense, you could say the buyer pays the fees." Source: Realtor.com - "Who Pays The Real Estate Agent When You Buy A Home?" Sellers factor in the cost of commissions when they price their homes. Typically, the listing agent and the buyer's agent split the commission from the transaction. ‘The funds come off the seller’s side, creating the illusion that the seller pays,’ says Jay Reifert of the Excel Exclusive Buyer’s Agency in Madison, Wis. "But you are the only one bringing money to the closing table." Source: HGTV.com - "Learn The Pros & Cons of A Buyer's Agent"
Source: The Balance - "Who Pays The Commission To The Real Estate Agent?" Agent fees are your single largest expense when buying a home. Since real estate agent commissions are rolled into a home’s asking price, as a buyer, you’re essentially footing the bill when it comes time to close on your home. Before the internet, buyer's agents had to pull home listings for their clients, drive them around on home tours, price every home based on comps, and handle all of the offer and closing paperwork manually. While today’s buyers often prefer to house hunt on their own, traditional real estate agents may still spend 80% of their time driving potential clients around who may never make a deal and marketing themselves to find new clients. The 2.5 - 3% buyer's agent commission you pay mostly helps to cover these sunk costs rather than the time they spend actually helping get your offer accepted and getting you into your new home. In short, buyer's agents work has evolved, but their fees haven’t. How can SimpleShowing afford to give back half the buyer's agent commission fee? It’s simple: because we’ve focused on making the homebuying process more efficient, which means we can pass the savings onto you. There truly are not many hard costs in shopping for a home, which is why it's silly to pay an agent thousands of dollars to simply unlock a few doors and create a offer. Instead of relying on just one agent who may or may not be available, we’ve created a model where buyers get access to an entire team of homebuying experts to help, answer the hard questions, and reach out to seller's agents for property-specific information 9am-7pm, 7 days a week. Our agents are employed by SimpleShowing and focus primarily on showing homes and writing offers. They spend less time on prospecting for new clients, so they're able to show you homes on-demand by booking through our website or mobile app. We only pair you with one of our top-rated local buying agents once you’re ready to see a home or make an offer. Because our buying agents only work with you once you’re ready to buy, they’re able to provide their expertise during the most important part of the buying process: getting your offer accepted and guiding you through negotiations, closing, and escrow. And, because your buying agent hasn’t spent most of his or her time driving you around or looking for new clients, we can give you full support and serious savings when you need them the most. So, you get thousands back when you buy with us -- $5,037 on average. Buying a home is slow, frustrating, and expensive. Yet, it hasn’t changed in almost 100 years. So, we’re inventing the modern way to buy. 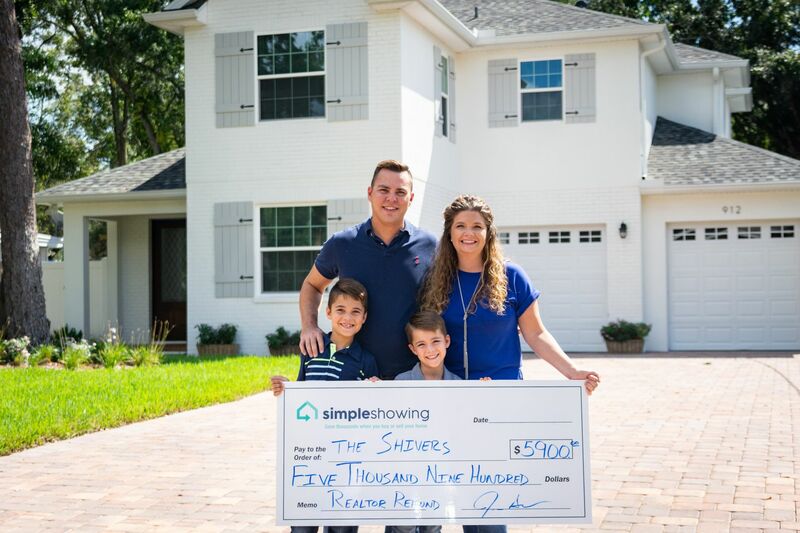 At SimpleShowing, our mission is to make buying a home simple and more affordable by giving everyone the confidence to own their future. So far, we’ve helped thousands of folks buy hundreds of homes in the Southeast and saved homebuyers nearly $1 million in unnecessary fees. Still have questions on buyer's agent commission or how our commission refund works? Shoot us an email or contact us to speak with one of our home buying experts.